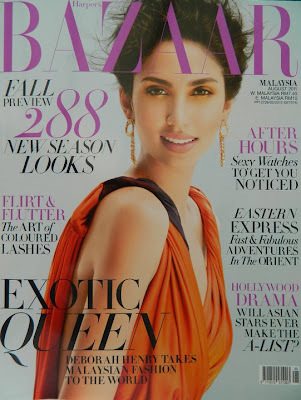 Photo: Miss Universe Malaysia 2011 Deborah Henry on Harper’s Bazaar Magazine, August 2011 Edition. Deborah Henry was crowned Miss Universe Malaysia 2011 on January 27, 2011. Deborah Henry is 25 year old and will represent Malaysia in Miss Universe 2011 in Brazil. Courtesy of Miss Universe Malaysia.